PML-N spokesman Pervez Rasheed on Sunday said consultations would be made with all political leaders and stakeholders on how to address major national issues, including terrorism. Talking to reporters, he said the PML-N would contact all political parties, including the PTI, to make Pakistan a safe country. He said the process would begin after having complete election results. 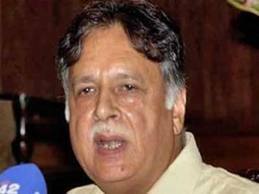 The PML-N leader said his party made successful efforts to resolve constitutional issues during the previous regime. He said after assuming power, his party would make sincere efforts to resolve social and economic problems of the country and overcome challenges being faced by Pakistan. Rasheed said he did not think the victory in the election was a game of gaining power, but to serve the masses in the real sense. He said it was time all political forces sat together and took their responsibility with all seriousness to resolve the national problems. To a question‚ Rashid said today’s elections were reflection of the public desire that they had complete faith in strengthening democracy and there was no room for dictatorship in the country. Another leader, Khawaja Saad Rafique, said after complete announcement of the election results‚ the meeting of the newly-emerged National Assembly should be convened without any delay. He said all political parties had to work jointly to move Pakistan towards its destination with sincere efforts.